When the restaurant Chez Panisse opened in Berkeley California in 1971, its owner had neither formal cooking education nor restaurant experience. She did have a passion for French food and a big desire to learn how to make it. Her texts were Elizabeth David’s books on French cooking and her classroom was her home, where she made dinners for friends. Jeremiah Tower answered Alice Waters’ help-wanted ad for someone to come up with 5-course menus based on Elizabeth David’s recipes and cook them in her new restaurant–Chez Panisse. He had an M.A. in architecture from Harvard and, like his new boss, no cooking credentials. He had, however, read Elizabeth David’s book French Provincial Cooking. Together they established a restaurant that became an influential example of how to tailor one’s cooking and eating according to what is available locally and seasonally and, in the process, improve the quality of what goes on the American table. Ratatouille Chez Panisse modifies this classic dish by simmering the vegetables with a bunch of fresh basil and sparking them with a trace of hot pepper. The result is pleasing and distinctive. a large-ish Eggplant, or a number of smaller ones: Sizes of eggplants vary from country to country and market to market. About 2 – 3 cups of small, peeled cubes will be the right amount. 1/4 teaspoon of Dried Red Chili Flakes or half of a fresh Thai Green Chili, seeded and chopped: The photographed ratatouille is made with some Thai Green Chili. 3 fresh Tomatoes, cut in small cubes: Made with a can of cubed tomatoes, this ratatouille is still very good. 3 medium Zucchini, cut in small cubes, or about 1 and 1/2 cups of cubes: If Yellow Squash looks good in the market–and you like it–you might substitute all or part of the Zucchini with it. 10 leaves of fresh Basil: They will be chopped and added to the ratatouille after it is cooked. Wait until then to chop them so they don’t discolor. 1. Put the little cubes of eggplant in the colander and salt them well. Leave them to drain for at least 30 minutes. Squeeze them by handfuls to further dry them out and transfer them to a towel or a plate. 2. Heat 2 Tablespoons of the olive oil in the casserole and add the eggplant. Sauté the cubes over medium heat until they are golden. With a slotted spoon, remove the cubes to a plate and set them aside. 3. Add 2 more Tablespoons of olive oil to the casserole and sauté the onions until they just begin to turn golden, too. Add the garlic, red chili flakes or green chili, the bouquet of fresh basil and a grind or two of salt. Cook them over medium heat, stirring for 2 or 3 minutes. 4. Add the red pepper cubes and cook, stirring for 2 or 3 minutes more. 5. Add the zucchini (and/or yellow squash) and the tomato cubes. Cook for 10 minutes more, then add the sautéed eggplant and cook for about 10 more minutes–or until the vegetables are tender and well combined. 6. Remove the bouquet of basil. 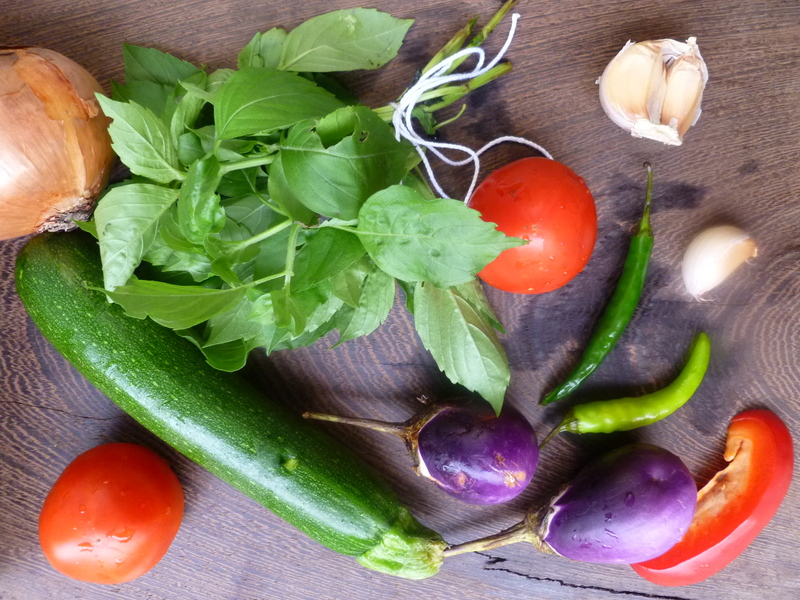 Chop the leaves of fresh basil leaves and add them to the ratatouille. Taste and season it with freshly ground black pepper and salt. The ratatouille is good to eat both hot and at room temperature. 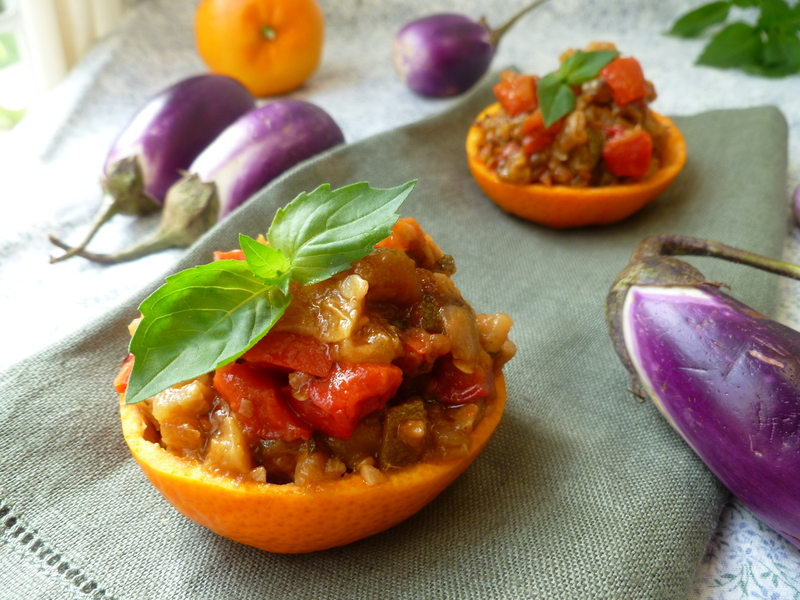 Last Touch Serving Suggestion: If the ratatouille is part of a lunch or dinner menu, it is pretty served in half-shells of clementine and garnished with sprigs of fresh basil. Cut the clementines in half, scoop out the flesh and squeeze it for juice. The juice may be frozen and used for some other recipe. 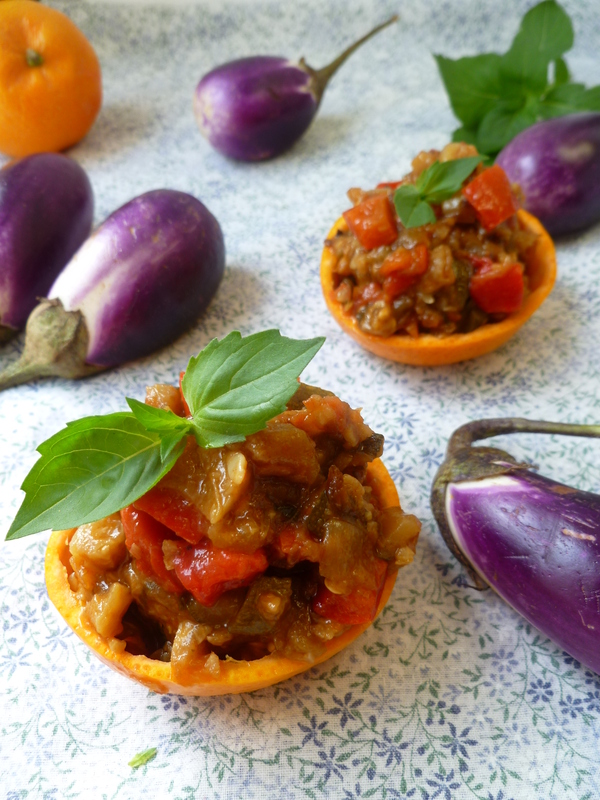 Place ratatouille in the shells, garnish with basil sprigs and place a shell on each plate with whatever you serve along with it. A Note: Ratatouille Chez Panisse is adapted from the recipe in Alice Waters’ book The Art of Simple Food: Notes, Lessons and Recipes from a Delicious Revolution (2007). It is included in the Occasional Menu: Into the Picnic Basket. A Second Note: Eating History: Thirty Turning Points in the Making of American Cuisine (2009) by Andrew F. Smith includes a chapter about Alice Waters, Chez Panisse, and their influence on American cooking and eating. The book is a ‘not-dry’ history of some of the people, events and institutions that have shaped Americans’ tastes in food. Another mouthwatering recipe ! 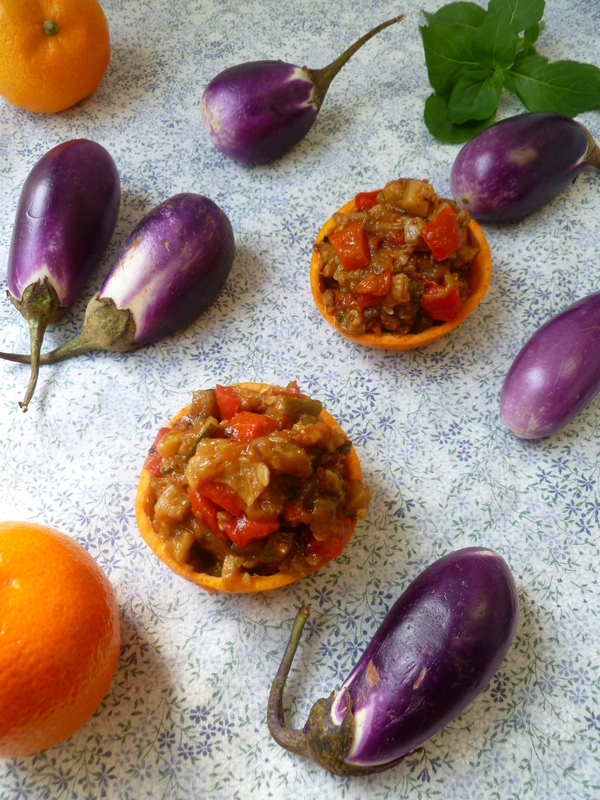 Now that all these vegetables are in season, I will try this version of the ratatouille and add basil from my balcony pots ! How well this recipe complements Michelle Obama’s “American grown” book about her White House garden and improving the way America eats – seems you two are on the same page !